There’s so much to love about Avanti - one of the most trusted names in Australian kitchenware for over 20 years and chosen by both home cooks and professional chefs because of its simplicity of design and its high quality. Avanti is the Australian brand that anticipates your needs from boiling a cup of tea to preparing a special dinner. 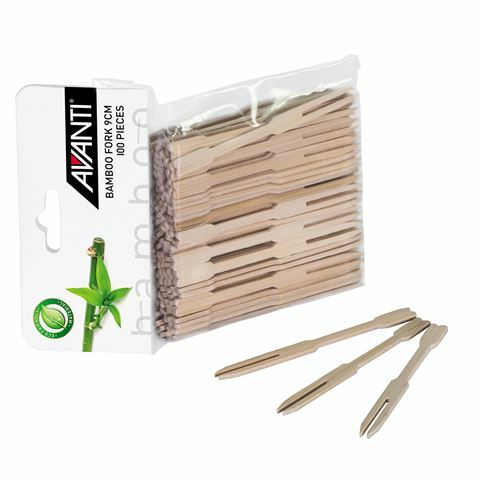 Thanks to our continued love affair with Asian food, Avanti has come to the rescue with sets of bamboo accessories in addition to their collection of bamboo steamers. These Bamboo Forks are made from strong, sustainable bamboo perfect for spearing food at picnics, creating fun canapes or using at the BBQ. Thanks to the Avanti name you know they’re high quality and you’ll never want to use a cheap, plastic fork again. Put them on the compost, they're biodegradable. Ideal for outdoor entertaining . Presented in a pack of 100.